Pinelands Nursery: 5 Questions to Ask Yourself When Planting Native Wetland Plants. 5 Questions to Ask Yourself When Planting Native Wetland Plants. We all want to be a part of a successful project. There are many factors that go into this. Below are 5 simple questions that you can ask yourself to help ensure that success. Is the site freshwater or brackish? If it is brackish what is the salinity level? If you are in a coastal plain region this is a very important question. It is never safe to assume. It does not take much to collect a water sample from an incoming tide and have it tested. Most fish stores can test water for a fee or the nursery in which you are purchasing your native plants should be able to test it as well. Once you know what the salinity is in parts per thousand you can start with your plant selections. What native plant material exists at the site? The best was to help select plant material in an undisturbed site is to notice your surroundings. Monitor the native material that is growing on your site and their growth patterns. If you are planting a wooded area and want to plant a shrub layer and one does not exist there may be reasons why. If there is Facultative wet species growing on the site then you know that you can make selections from other facultative wet species. These are all keys in making your selection. 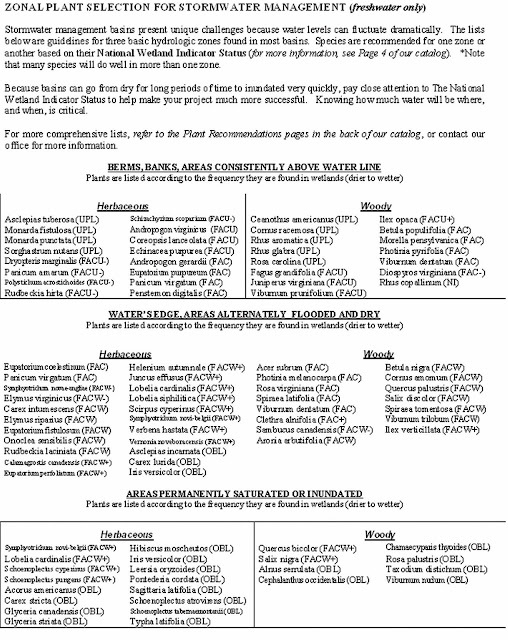 Do you know the wetland indicator status of the material you are planting? U.S. Fish and Wildlife, as an act of Congress, was tasked with cataloging native plants in the United States and their occurrence naturally in wetlands. As stated above, if native material exists on site with a certain indicator status that will give you clues as to the hydrology of the site. 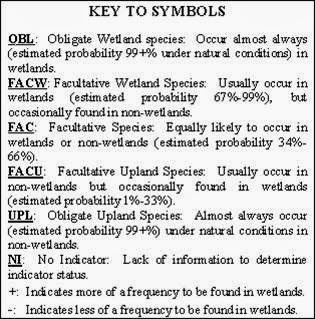 Below is the wetland indicator status key. You can check on the USDA Native Plant Database for the wetland indicator status in your region of any native plant at usda.plants.gov. Will any of the plants be permanently inundated with water or tidally influenced? Certain plants exist in certain conditions for a reason. In a tidal salt marsh situations you will notice that only certain plants, like Smooth Cordgrass can survive. This is because they need to be wet and dry twice a day. Some freshwater plants can handle a range of conditions from tidal, to permanently inundated, to alternately flooded or alternately dry. 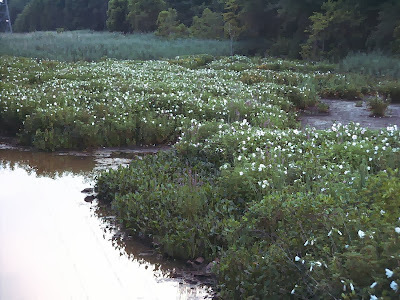 Many native wetland plants can handle permanent inundation up to a certain depth in inches. Below are some helpful charts to help guide you through this. Are geese a factor at the site? Geese can decimate entire plantings over night. Geese love to eat the tubers of Duck Potato or the roots of Smooth Cordgrass. If geese are a factor protect your site with Goose Exclusion netting. You’ll need to put netting in the water so that they can not swim into your site and also on land so that they can not walk into your site. A goose need approximately 10 feet of space to feel comfortable to land or take off. Try to keep your rows of netting at least 10 feet but in larger areas where you can not incorporate overhead twine across the top and attach mylar stripping to help deter them. Below is a successful example of using goose netting.